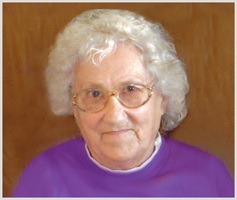 Provide comfort for the family of Shirley Graves with a meaningful gesture of sympathy. It is with heavy hearts that the family of Shirley Mabel Graves of Iron River, Alberta announces her passing on Saturday, March 16, 2019 in Bonnyville at the age of 93 years. Shirley will be forever loved and remembered by her five children: Gordon (Colleen) Graves of Iron River, AB, Judy Vosper of Barriere, BC, Ralph (Fran) Graves of Lloydminster, SK, Michael (Cherie) Graves of Barriere, BC, Kathryn Graves of Calgary, AB; seventeen grandchildren; nineteen great grandchildren. Shirley was predeceased by her husband: Mitchell Graves; daughter: Barb Graves; son: Richard Graves; step-daughter: Shirley Godfrey; parents: Richard & Grace Prophet; sister: Janet Patterson; step-grandson: Lance Godfrey. Service of Remembrance, Saturday, March 23, 2019 at 2:00 p.m. at the Sandy Rapids Community Hall, Sandy Rapids, AB with Justin Snyder officiating. Memorial tributes in memory of Shirley may be sent to the charity of one’s choice.